You are Here:Home/WE SHALL ENSURE EFFICIENT CHANNEL MANAGEMENT OF DEEP SEA PORTS. – MD NPA. WE SHALL ENSURE EFFICIENT CHANNEL MANAGEMENT OF DEEP SEA PORTS. – MD NPA. 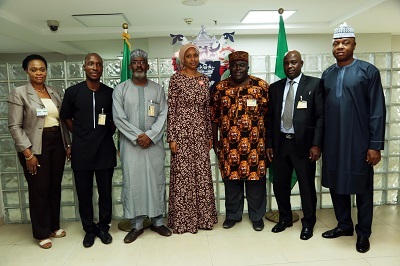 Managing Director Nigerian Ports Authority [NPA] Hadiza Bala Usman has reiterated the determination of the Authority to support the completion of all deep sea Ports projects across the country, considering their potential to the future maritime activities of the nation. According to the Managing Director, the early completion of the project would not only facilitate operational efficiency in the nation’s Maritime system but would also further strengthen the Federal Government’s policy of the Ease of Doing Business. 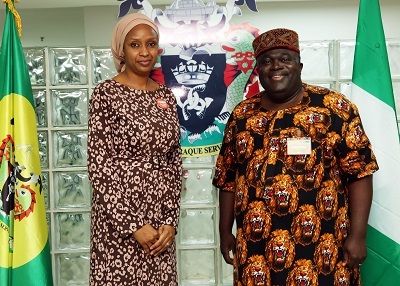 Hadiza Bala Usman was speaking in Lagos yesterday when Management of the Infrastructure Concession Regulatory Commission [ICRC] led by its Acting Director General Engineer Chidi Izuwah paid her a working visit in her office. She restated the need to fast track the nation’s navigational Channels, so as to accommodate bigger vessels which would generate more revenue to the country and improve trade facilitation in the sub region. Hadiza further stated that plans are almost being concluded for the business model meant for the Lilypond Terminal, as part of Management’s resolve for improved service delivery in the terminals and charged all concerned with the working document for the review of the terminal’s agreement to speed up the processes that would allow for the swift consideration and possible approval for a 5 years renewal being sought by Lilypond. Earlier in his opening remarks the visiting ICRC Director General applauded the numerous positive changes the Maritime sub sector has witnessed since the assumption of office of the Managing Director. He commended progress made in the area of improved synergy with relevant Stakeholders, providing a level playing ground for all, efficient service delivery for Port users, improved Port operations amongst others. The Director General lauded the reforms in the Port Industry which dates back to 2006 and stated that the ICRC Management was willing to support that the drive towards ensuring the growth witnessed this far is guarded to the latter in view of the economic benefits to the nation at large. Engineer Izuwah informed his host that his ICRC which acts as the ‘’eyes and ears’’ of the Federal Government was in Lagos to have a first -hand assessment of works at Lilypond Terminal and Josep Dam amongst other MDA Projects by the Federal Government. It was keen at identifying the various encumbrances being faced by MDA’s towards speedy job completions as well as provide suggestions through effective synergy with those concerned.